I rarely go into M&S. This window display is a prime example of why. 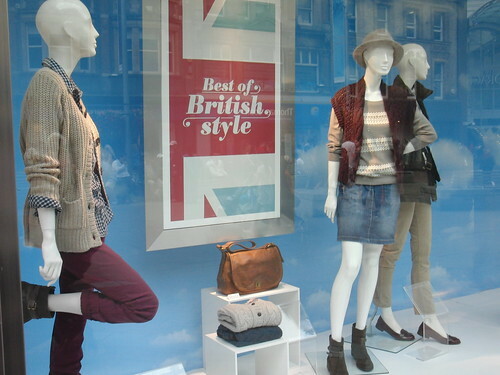 The slogan says “the best of British style” the mannequins are wearing shades of biege jumpers, denim and undistinctive footwear. Neither classic, exciting, country, or any kind of combination that could really be described as style except perhaps ‘comfortably numb’. I’m confident that British styling can do a whole lot better! This scribble was published on Monday, October 8th, 2012. You can follow any banter on this scribble with the RSS 2.0 feed. You can share your inspired musings after typing the anti spam word near the bottom of the page. But no Pinging because its too naughty. The flag segment looks depressingly washed-out, too. I’ve been much less keen on M&S since my brother was stopped by security for shoplifting. After a few minutes, it became clear: the CCTV operator had seen somebody on crutches shoplifting, and relayed this to the guard on the door – who grabbed ‘the guy on crutches’. The WRONG ‘guy on crutches’, needless to say: the culprit caught on camera had nothing in common besides gender and crutches, but by this time had presumably made a clean getaway. The only items I buy from M&S are knickers and sandwiches. Thanks for the link. I like. Sadly, Window dressing has become a much underrated art.